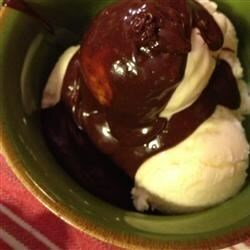 "A rich hot fudge sauce that is great over ice cream, fresh strawberries, or as a cake filling when cooled." Heat sweetened condensed milk and chocolate in a heavy saucepan over medium-low heat until chocolate is melted, stirring often, about 5 minutes. Remove from heat. Add butter and stir until melted, about 5 minutes more. See how to make delicious homemade chocolate sauce. Absolutely loved this recipe. SO quick, SO easy and SO delicious! Note: 1 cup chocolate chips = 6 oz. chocolate squares. Nice smooth sauce, consistancy was perfect--VERY sweet. I want to try this again with unsweetened chocolate, then re-review. This is perfect if you make and chill then use in other recipes, like putting a layer of the fudge between peanut butter cookie dough and baking as a bar. YUM!! A nice simple recipe that tastes better than the high fructose corn syrup you get at the stores. I had all ingredients and made a nice surprise for my wife.